President Obama has denounced Russia for a “breach of international law” with its military intervention in the Crimea. Norman Solomon: Heard the One About Obama Denouncing a Breach? The U.S. government routinely violates international law with drone strikes in Pakistan, Yemen, Somalia and other countries. Human-rights groups like Reprieve have documented many of those violations in recent reports, and the European Parliament has just condemned the practice as illegal -- but the USA’s missile attacks continue. 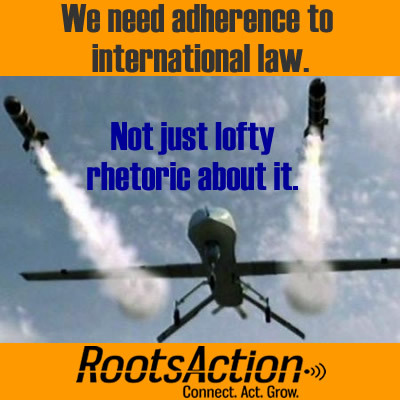 President Obama, your condemnation of Russia for a “breach of international law” rings hollow while your administration continues to violate international law with drone strikes and other missile attacks across borders. I urge you to end those U.S. violations of international law and move toward a new era of genuine adherence to international law. Please leave a comment if you'd like. 20299 4.7 years ago John Prehn Salt Lake City, UT , US And, supporting and re-arming the Israeli terrorist state is illegal too.